Minneapolis (January 30, 2018) – Dunwoody College of Technology announced today a $500,000 grant by the Otto Bremer Trust, the latest capital gift from the region’s business and philanthropic communities to support Dunwoody’s effort to meet the challenge of bridging the skills gap in Minnesota and the Upper Midwest. With a growing student population in its School of Engineering and other STEM-related majors as well as the need to better serve an increasingly diverse student body, Dunwoody has embarked on the first phase of an ambitious campus facilities plan. The Otto Bremer Trust investment, combined with other generous donations, will support the transformation of a currently under-utilized gymnasium into a two-story space with a state-of-the-art Learning Commons on the upper floor and a new Welcome Center for students and families on the lower level as well as an open area for community and student gatherings. 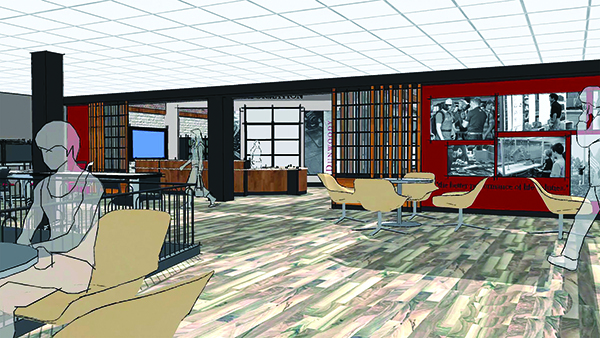 In order to recognize the gift, Dunwoody will name a student gathering, collaboration, and study space at the entrance to the Learning Commons as Otto Bremer Trust Hall. A private, not-for-profit college, Dunwoody relies on charitable contributions to help fund core elements of its academic program, including scholarships, equipment, and new construction like the gymnasium remodel. As the only private, not-for-profit technical college in the Upper Midwest, Dunwoody is uniquely positioned to expand its more than a century-long track record of supplying the region with graduates who have the technical skills, work ethic, and passion and curiosity for their chosen field to help the region’s employers not only fill their current open positions, but also develop future generations of leaders and entrepreneurs. Based in St. Paul, Minn., the Otto Bremer Trust is a private charitable trust established in 1944 by founder Otto Bremer, a successful banker and community business leader. OBT owns 92 percent of Bremer Bank and manages a diversified investment portfolio. This mission of OBT is to invest in people, places and opportunities in the Upper Midwest. Since its inception, OBT has invested more than $600 million in organizations throughout Minnesota, North Dakota and western Wisconsin. Founded in 1914, Dunwoody College of Technology is the only private, not-for-profit technical college in the Upper Midwest. It has provided a hands-on, applied education to more than 200,000 men and women, who in turn have gone on to meaningful and rewarding careers and become outstanding technicians, successful entrepreneurs and industry leaders. Located on the western edge of downtown Minneapolis, Dunwoody offers more than 30 certificate, associate’s degree and bachelor’s degree programs in the areas of Applied Management, Automotive, Computer Technology, Construction Sciences & Building Technology, Design & Graphics Technology, Engineering, Radiologic Technology, Robotics & Manufacturing, and Workforce Training & Continuing Education.